Avocado American Style: Mac and Cheese! For my final entry into the Avocado Week festivities, I humbly submit my favorite. I was able to substitute avocado for the butter and most of the cheese, then used light cream cheese for the rest. Enjoy! Set a large pot of water to boil. Preheat oven to 400 degrees. Add cream cheese, avocados, salt and pepper to a food processor and blend until well-incorporated and creamy. Set aside. Spray a large skillet with cooking spray and sauté the shallots on medium-high heat until browned, about ten minutes. Set aside. Cook pasta according to package directions and drain well. Pour back into the pot and add the avocado mixture. Stir to coat the pasta evenly and add the shallots. Tear the prosciutto into bite-sized pieces and add, stirring again. Spray a large glass casserole dish with cooking spray and pour in the pasta. In a medium bowl, whisk together the oil and vinegar. Add the breadcrumbs and toss to coat. Distribute evenly over the pasta. Bake for 15-20 minutes or until breadcrumbs are a crispy golden brown. Serve. Arigato Avocado! Mixing it up Asian-style. Spray a medium skillet with cooking spray and heat to high. Spray salmon fillets with cooking spray, sprinkle evenly with salt and pepper, then sear for 3-4 minutes on each side. Set aside to cool. In a medium bowl, stir to combine the sesame oil, mustard, red wine vinegar, garlic and soy sauce. Chop salmon into 1/2-inch cubes and combine with the mixture, stirring to coat evenly. Add the avocado and toss gently to mix. In a large bowl, whisk together the honey, half of the lemongrass and rice wine vinegar. Cook rice according to package directions. Mix with honey, lemongrass and rice wine vinegar, tossing to coat. Spoon equal amounts onto four plates, top with avocado salmon mixture, sprinkle with remaining lemongrass and serve. Serves four. Continuing on Avocado Week here at It's All About the Garnish, I thought I'd try to spotlight the creaminess of avocados, and the best venue for that is in French food. Ah, the French. All about cheese and butter, which I love but my scale doesn't. What if I could replace the cheese in a stuffed pork chop, and cut the butter in half in the classic burre blanc sauce? Use some classic French herbs, and it's magnifique! In a medium bowl, mash two of the avocados and the herbs together until well blended. Slice a pocket into the side of each pork chop, wiggling a finger inside to make sure it’s deep enough to fill. Stuff each pocket with equal amounts of the avocado herb mixture and secure closed with a wooden pick. Heat the olive oil in a large skillet to medium-high heat. Sprinkle the pork chops with salt and pepper, then brown for three minutes per side. Reserve skillet, and remove pork chops to a large glass casserole dish. Bake for fifteen minutes or until done. While the pork chops are baking, make the burre blanc. Mash the remaining avocado in a small bowl. In a medium saucepan, stir to combine the wine, vinegar and shallots. Cook on high heat until reduced by two thirds, stirring constantly. Remove from heat, strain out the shallots and return sauce to the pan. Add the chilled butter a piece at a time, whisking to melt completely. Add the avocado and stir until creamy. When the pork chops are done, spoon a few tablespoons of the sauce onto the center of four plates. Place a pork chop onto the sauce, then spoon more sauce over the meat. Sprinkle with thyme and serve. This recipe is fantastic because it's so easy to prepare, yet so lush and impressive when presented on the plate. The fennel is unexpected, the avocado is creamy and the prosciutto just the right amount of salty...a delicious combination! In a medium bowl, mash together the avocado, three-quarters of the fennel, salt, pepper and provolone cheese. Slice a pocket into the side of each chicken breast. Stuff each chicken breast with equal amounts of the avocado mixture. Wrap each breast with a slice of prosciutto, making sure to seal the pocket closed, wrapping the ends underneath each breast. Heat olive oil to hot but not smoking in a large skillet. Add the chicken breasts, prosciutto ends down first, to the pan and cook for three to five minutes per side, or until browned. Transfer to a large glass casserole dish and bake for 15 minutes or until done. Reserve skillet. While the chicken is cooking, make the sauce. Add the remaining fennel to the pan and cook on medium-high, scraping up any browned bits, for about three minutes. Add the chicken broth, bring to a boil and boil for three minutes. Reduce to medium-low heat and simmer until ready to use. When the chicken is done, place each breast on a plate, drizzle with sauce and serve. Serves four. To celebrate the beginning of the outdoor entertaining season (and the impending completion of our new deck! ), I've decided to post a few avocado recipes this week. We'll kick it off with a favorite from last summer, and then I'll post some new recipes I've concocted lately. Enjoy! We had a party recently, and I made some awesome nibbles. Spray a large baking sheet with cooking spray. Fold each wonton wrapper on one end so it resembles a spoon. Sprinkle with cayenne pepper and bake for about 4-6 minutes, or until light golden brown. In a food processor, blend the curry paste, garlic, green onions, avocados, lemon juice, soy sauce and cream cheese. Scoop this mixture into a small zip-top bag and push contents to one corner. Use scissors to snip a small bit from the corner and squeeze about a tablespoon of the mixture onto each wonton. Sprinkle with the red cabbage and serve. She used king crab for the filling and coated each cake with pulverized almonds. They were absolutely delicious, and paired beautifully with the tangy salad! This marinade can be used successfully with just about any kind of white meat; shrimp, chicken even lobster tails (I'm going to try it with scallops next time!) The salsa is light and easy to prepare, and in my opinion, really brings the dish together. You may get a little frustrated when you read the ingredients because there are no measurements. I left my measuring spoons in the drawer for this one on purpose. You can make it as spicy or tame as you like. I wouldn't recommend more than a tablespoon of any one dry spice though. Any other fun pepper you might have on hand, like poblano or serrano if you're brave! Add all your dry spices in a bowl. I mixed mine in a sealable plastic bowl so I could add my shrimp to it, shake it and toss it in the fridge for a few hours. Now add your olive oil and white wine. Add enough to adequately marinade whatever meat you decided on. Then squeeze in a lime or two and whisk everything together. Drop in the shrimp, toss to coat and throw it in the fridge for at least an hour, up to four hours. Fire up your grill and cook your shrimp until opaque, usually a few minutes per side. When using shrimp, get the biggest ones you can afford. They're easier to cook on the grill and more impressive when you serve them. Get rid of the marinade when you put the shrimp on the grill (it had raw meat in it, duh!) At first I tried cooking mine on some foil on the grill, but I wanted more smoky flavor and the cool grill marks on the shrimp. This would be a good time to use that grill basket you have lying around. Once your ear of corn is shucked and cleaned, carefully take a sharp knife and cut the kernals off. Use nice even strokes straight down the length of the ear. The sweet corn is fresh, not cooked, and it adds a consistency and fresh taste to the final product that will be lacking if you decide to use something frozen or canned. Add them to a non-reactive mixing bowl. Add the avocado, onions, tomato and jalepeno. Juice a lime or two into the bowl and lightly toss. Be careful here or you'll crush the avocado and make a mess of the whole thing. Salt and pepper to taste. Don't be shy, a couple of pinches of salt won't really be enough, but you can't remove it if you add too much. You could also use a quarter of a red onion but not too much if you substitute-too much red onion will overpower this salsa and you'll lose the taste of the fresh sweet corn and the zing of the jalepeno. 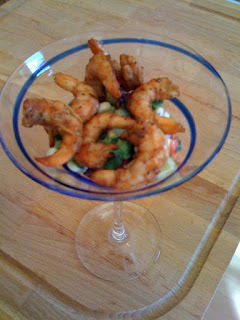 Presentation: Spoon the salsa into martini glasses and top with your grilled shrimp. Whip it, whip it good. On a cookie sheet, take some of those won ton sheets you see in the grocery store and fold them so they resemble little shovels, or into some sort of shape that creates a handle, and spray them with olive oil. Sprinkle with cayenne pepper and bake at medium heat for about 6 to 8 minutes, or until they start browning a bit. Put all your avocado mixture into a ziploc bag and cut off a corner, so you can use it as a pastry bag. Squirt this green goodness onto the won tons. Chop a bit of red cabbage and sprinkle it on top. Serve and revel in your image as party goddess.